Salco RF-888 air-operated top carton roll stapler. Similar to CCC RC1000T. Intended for securing the top flaps of corrugated boxes after filling. Meets the demands of a medium-to-heavy duty production applications. Uses 888/15, 888/18 1M roll staples, leg lengths 5/8" and 3/4". The Salco RF-888 is a roll feed stapler designed as a cost effective tool that meets the demands of a medium-to-heavy duty production applications. 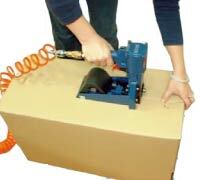 The rear load design allows the operator to re-load the stapler quickly and safely. Uses 1M roll staples for reduced production stoppage timeto re-load the stapler. Weight 5 lbs. 3 oz. Roll Staples 888/15 5/8", 888/18 3/4"